North American action replay rebattle codes please! Hi I was wondering if someone could give me an action replay code that lets you rebattle dialga and palkia, and some other seperate rebattle codes such as heatran and regigigas and those guys. And if anyone knows how to make rebattle codes on pokesav or any other code making place, could you let me know how or email me with really good details at [email protected] Thank you. Where can I find Regirock, Regice and Registeel? I have gained access to the Snowpoint temple, but the statue of Regigi.. I need some help I need the delete HMs cheat can someone find it for me? I have heard that you can only catch dialga + palkia once you stop gal..
What is the Action Replay DS code for full pokedex, please tell me, I'.. I am pretty good about find areas to train my Pokemon at most every l.. Welcome to our unofficial gude to Pokemon Platinum. 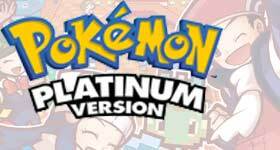 Platinum is the directors cut version of the popular Diamond and Pearl games, it features Girati..
Help me get the gracidea flower Can anyone make me a ..
action replay code for pokemon platinum I need some h..
ar code for all ribbons Is there an action replay cod..
wild pokemon modifier code Can someone find a wild Po..
Dialga + Palkia I have heard that you can only catch ..
A Place to Train Level 40's through ..